Bukhara (Uzbek: Buxoro; Tajik: Бухоро; Persian: بخارا‎‎), is one of the cities (viloyat) of Uzbekistan. Bukhara is a city-museum, with about 140 architectural monuments. The nation's fifth-largest city, it had a population as of 31 August 2016 of approximately 247,644. Humans have inhabited the region around Bukhara for at least five millennia, and the city has existed for half that time. The mother tongue of the majority of people of Bukhara is Tajik. Located on the Silk Road, the city has long served as a center of trade, scholarship, culture, and religion. 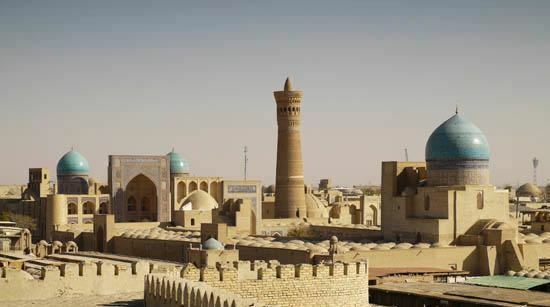 UNESCO has listed the historic center of Bukhara (which contains numerous mosques and madrassas) as a World Heritage Site. Bukhara was known as Bokhara in 19th and early 20th centuries English publications and as Buhe/Puhe（捕喝）in Tang Chinese. The history of Bukhara stretches back millennia. It is now the capital of Bukhara Region (viloyat) of Uzbekistan. Located on the Silk Road, the city has long been a center of trade, scholarship, culture, and religion. During the golden age of the Samanids, Bukhara became a major intellectual center of the Islamic world, second only to Baghdad. 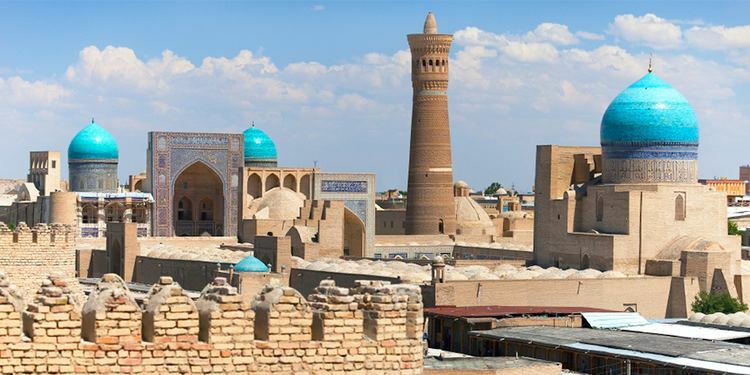 The historic center of Bukhara, which contains numerous mosques and madrassas, has been listed by UNESCO as one of the World Heritage Sites. Kalyan minaret. More properly, Minâra-i Kalân, (Persian/Tajik for the "Grand Minaret"). Also known as the Tower of Death, as according to legend it is the site where criminals were executed by being thrown off the top for centuries. The minaret is most famed part of the ensemble, and dominates over historical center of the city. The role of the minaret is largely for traditional and decorative purposes - its dimension exceeds the bounds of the main function of the minaret, which is to provide a vantage point from which the muezzin can call out people to prayer. For this purpose it was enough to ascend to a roof of mosque. This practice was common in initial years of Islam. The word "minaret" derives from the Arabic word "minara" ("lighthouse", or more literally "a place where something burn"). The minarets of the region were possible adaptations of "fire-towers" or lighthouses of previous Zoroastrian eras. The architect, whose name was simply Bako, designed the minaret in the form of a circular-pillar brick tower, narrowing upwards. The diameter of the base is 9 meters (29.53 feet), while at the top it is 6 meters (19.69 feet). The tower 45.6 meters (149.61 feet) high, and can be seen from vast distances over the flat plains of Central Asia. There is a brick spiral staircase that twists up inside around the pillar, leading to the landing in sixteen-arched rotunda - skylight, upon which is based a magnificently designed stalactite cornice (or "sharif"). Kalân Mosque (Masjid-i Kalân), arguably completed in 1514, is equal to the Bibi-Khanym Mosque in Samarkand in size. The mosque is able to accommodate 12 thousand people. Although Kalyan Mosque and Bibi-Khanym Mosque of Samarkand are of the same type of building, they are different in terms of art of building. 288 monumental pylons serve as a support for the multidomed roofing of the galleries encircling the courtyard of Kalyan Mosque. The longitudinal axis of the courtyard ends up with a portal to the main chamber (maksura) with a cruciform hall, topped with a massive blue cupola on a mosaic drum. The edifice keeps many architectural curiosities, for example, a hole in one of domes. Through this hole one can see foundation of Kalyan Minaret. Then moving back step by step, one can count all belts of brickwork of the minaret to the rotunda. Mir-i Arab Madrassah (1535-1536). The construction of Mir-i-Arab Madrasah (Miri Arab Madrasah) is ascribed to Sheikh Abdullah Yamani of Yemen - called Mir-i-Arab - the spiritual mentor of Ubaidullah-khan and his son Abdul-Aziz-khan. Ubaidullah-khan waged permanent successful war with Iran. At least three times his troops seized Herat. Each of such plundering raids on Iran was accompanied by capture of great many captives. They say that Ubaidullah-khan had invested money gained from redemption of more than three thousand Persian captives into construction of Mir-i-Arab Madrasah. Ubaidullah-khan was very religious. He had been nurtured in high respect for Islam in the spirit of Sufism. His father named him in honor of prominent sheikh of the 15th century Ubaidullah al-Ahrar (1404-1490), by origin from Tashkent Region. By the thirties of the 16th century the time, when sovereigns erected splendid mausoleums for themselves and for their relatives, was over. Khans of Shaibanid dynasty were standard-bearers of Koran traditions. The significance of religion was so great that even such famed khan as Ubaidullah was conveyed to earth close by his mentor in his madrasah. In the middle of the vault (gurhana) in Mir-i-Arab Madrasah is situated the wooden tomb of Ubaidullah-khan. At his head is wrapped in the moulds his mentor - Mir-i-Arab. Muhammad Kasim, mudarris (a senior teacher) of the madrasah (died in 1047 hijra) is also interred near by here. The portal of Miri Arab Madrasah is situated on one axis with the portal of the Kalyan Mosque. However, because of some lowering of the square to the east it was necessary to raise a little an edifice of the madrasah on a platform. The Lab-i Hauz (or Lab-e hauz, Persian: لب حوض, meaning by the pond) Ensemble (1568–1622) is the name of the area surrounding one of the few remaining hauz, or pond, in the city of Bukhara. Several such ponds existed in Bukhara prior to Soviet rule. The ponds acted as the city's principal source of water, but were also notorious for spreading disease, and thus were mostly filled in during the 1920s and 1930s by the Soviets. The Lab-i Hauz survived owing to its role as the centerpiece of an architectural ensemble dating 16th-17th centuries. The Lab-i Hauz ensemble consists of the 16th century Kukeldash Madrasah, the largest in the city, along the north side of the pond. On the eastern and western sides of the pond are a 17th century lodging-house for itinerant Sufis, and a 17th century madrasah. Bahoutdin Architectural Complex is a necropolis commemorating Shaykh Baha-ud-Din or Bohoutdin, the founder of Naqshbandi order. The complex includes the dahma (gravestone) of Bahoutdin, Khakim Kushbegi mosque, Muzaffarkan mosque, and Abdul-Lazizkhan khanqah. The site is listed on the UNESCO World Heritage Site tentative list on January 18th, 2008. The Ismail Samani mausoleum (9th-10th centuries), is one of the most highly esteemed work of Central Asian architecture. It was built in the 9th century (between 892 and 943) as the resting-place of Ismail Samani - the founder of the Samanid dynasty, which was the last native Persian dynasty to rule the region in the 9th-10th centuries, after the Samanids established virtual independence from the Abbasid Caliphate in Baghdad. The site is unique for its architectural style which combines both Zoroastrian and Islamic motifs. The building's facade is covered in intricately decorated brick work, which features circular patterns reminiscent of the sun - a common image in Zoroastrian art from the region at that time which is reminiscent of the Zoroastrian god, Ahura Mazda, who is typically represented by fire and light. The building's shape is cuboid, and reminiscent of the Ka'aba in Makkah, while the domed roof is a typical feature of mosque architecture. The syncretic style of the shrine is reflective of the 9th-10th centuries - a time when the region still had large populations of Zoroastrians who had begun to convert to Islam around that time. Char Minor (alternatively spelled Chor Minor, and also alternatively known as the Madrasah of Khalif Niyaz-kul) is a building tucked away in a lane northeast of the Lyabi Hauz complex. The structure was built by Khalif Niyaz-kul, a wealthy Bukharan of Turkmen origin in the 19th century under the rule of the Janid dynasty. The four towered structure is sometimes mistaken for a gate to the madras that once existed behind the structure, however, the Char-Minar is actually a complex of buildings with two functions, ritual and shelter. The main edifice is a mosque. In spite of its unusual outward shape, the building has a typical interior for a Central Asian mosque. Owing to the buildings cupola, the room has good acoustic properties and therefore takes on special significance of 'dhikr-hana' – a place for ritualized 'dhikr' ceremonies of Sufi, the liturgy of which often include recitation, singing, and instrumental music. The former Magoki Attori mosque was constructed in the 9th century on the remains of what may have been an older Zoroastrian temple. 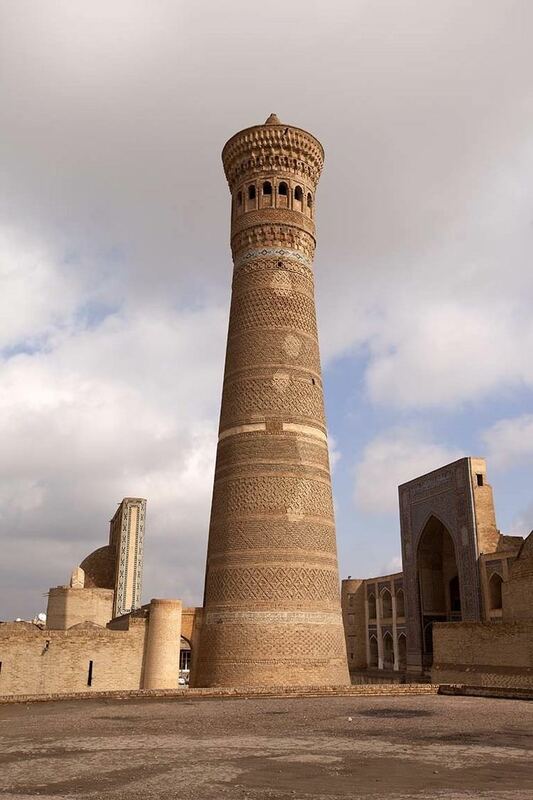 The mosque was destroyed and rebuilt more than once, and the oldest part now remaining is the south façade, which dates from the 12th century - making it one of the oldest surviving structures in Bukhara, and one of few which survived the onslaught of Genghis Khan. Lower than the surrounding ground level, the mosque was excavated in 1935. It no longer functions as a mosque, but rather houses a carpet museum. Bukhara Airport has regularly scheduled flights to cities in Uzbekistan and Russia. The M37 highway connects the city to most of the major cities in Turkmenistan including Ashgabat. The city is also served by railroad links with the rest of Uzbekistan, and is a hub for roadways leading to all major cities in Uzbekistan and beyond.